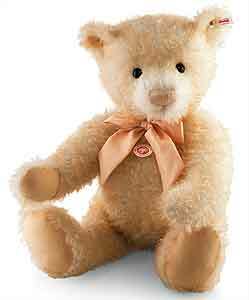 Little Tina Teddy Bear by Steiff. This beautiful hand made piece, in apricot mohair and wears the white ear tag, signifying this item as a Steiff limited edition, together with the famous gold plated Button in Ear. 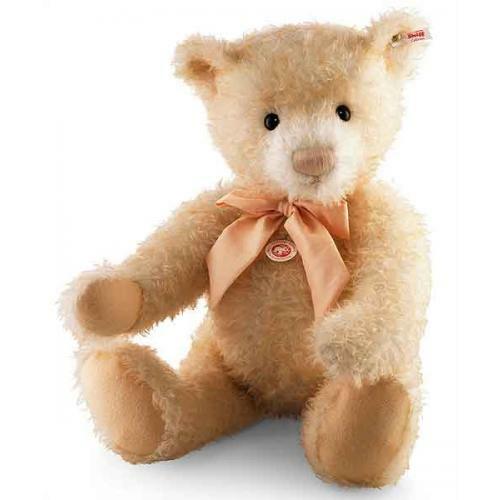 Ashby Bears proudly present Little Tina, the perfect partner for Little Tom, who looks at his girlfriend with admiration - at the fluffy ears that he could cuddle all over again, her apricotcoloured coat and her matching embroidered nose. No doubt, he is completely love-struck: since he met Tina he prefers to spend every minute with her. Who would be surprised? With her feathery, gently shining mohair she is definitely a bear to fall in love with. She is tall and yet graceful. She loves to be alive and lets others enjoy it with her.... Our collectors tip: Little Tina is limited to 500 pieces.